Pete and Re-Pete were walking on a bridge. Pete fell off; who's left? With close to twenty years in the Army, Repeater never got any higher in rank than Staff Sergeant. His performance in the field was always top-notch but he could never hack it in the garrison. He's not a barracks soldier and not officer material. But send him out in the bush beyond the furthest base camp, and you'll find that he's the one the other grunts want to soldier with. They know he's the one who's going to bring them back in one piece! As a SAW machine gunner, Repeater has to draw enemy fire while his unit moves into their offensive or defensive positions. His automatic weapon allows him to maintain a sustained volume of fire with a combination of subdued tracer and ball cartridge ammunition. He follows the tracer-on-target (TOT) observation method, and can fire from the shoulder, hip, or underarm, as well as from the ground in the bipod-steadied position, if needed. It often comes down to one versatile man and his weapon being the only things keeping Cobra forces pinned down long enough for the team to make their extraction point. Joes? Retreat? What madness is this! Repeater is another figure that's been de-Night-Forced for FSS 3.0 - this head was used in the Nocturnal Fire box set, but we're still counting it as "new." 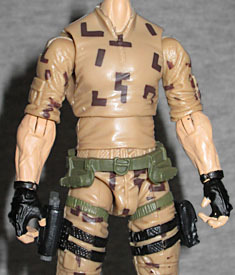 The card art makes him look like Captain America, but the sculpt on the toy really sells the "grumpy old soldier" angle. His hat has "Ranger" sculpted on the front. 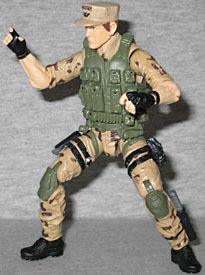 Below the neck, Repeater uses the same body as Battle Kata Roadblock, a re-use that would probably be a lot more exciting if we hadn't just gotten the 50th Anniversary Leatherneck that used the same thing. He does mix things up by using Resolute Roadblock's vest, and of course the colors are entirely different: tan with brown camo, rather than green with brown camo; that makes a big difference. 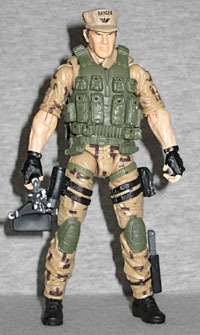 His kneepads, vest and belt are dark green, while his gloves, the knife sheath on his boot, the holster on his right leg and the pouch on his left are all black. He still has the Battle Kata belt, but no weapons to go on it - there are just two weird bumps on the front that serve no purpose. Repeater's articulation is good, but it did require some work to get moving properly: the peg on the elbow that fits up into the bicep and allows the lower arm to swivel absolutely would not turn; I had to boil the arms and pull them apart, at which point I found that both elbows had a small bit of flashing sticking off the peg; a couple quick snips later, the arms were pushed back in and moving perfectly. Otherwise, they both would have shorn off in the arm, and I'd have a broken toy. Other than those joints he moves at the head, shoulders, wrists, torso, hips, knees, and ankles. The head is a balljoint, but won't look up or down very far at all. What's truly disappointing, however, is the accessories. Literally the only interesting thing about the original 1988 Repeater was that he carried an Aliens-style "steadi-cam" machine gun, and yet this update doesn't. Even the Night Force version from 2013 had one! All this figure gets is an M249 with a bipod and a removable ammo box (first seen with the Ultimate Roadblock we suggested buying instead of Battle Kata). It's a nice gun, and it suits the squad machine gunner very well, but it's like releasing Scarlett without a crossbow. We already know they have an arm like that, because PoC Destro came with it. Why not reuse that? Clearly he still had to come with the pistol and knife to store on his legs, but we'd gladly have given up the backpack (which doesn't play well with his vest, anyway) in exchange for a gun that had a robot arm attached to it. Repeater was never this big a character in G1, but it makes sense for a guy who'd be running around the battlefield carrying a huge weapon. Still, without his steadi-cam gun, he's just a generic soldier - which is fine if that's what you want, but it does the toy a disservice. Still, he's better than the last attempt to update Repeater to G3 standards - not because he was black, but because that figure was even more boring than this one.